Jeremias Jiao in the colors of the Philippine National Team. His name is Jeremias Jiao. That is what his birth certificate says. The only way that I would call him by his given name, though, was if my own name was Abraham or Moses. Because it is not, I asked him for his nickname. At home, he told me, he was called Totoy. Everyone else called him Jiao. That’s with the hard “J,” mind. Although, having taken up 12 units of Spanish in college, I did ask Totoy, shouldn’t the “J” be pronounced with an “H” sound, as in hiao? Yes, the boy agreed; that was probably the correct way of saying his surname; except that people just sort of got used to the other way. Totoy is the third boy of the athletic Jiao family of Cuenca, Batangas. The father, a sports enthusiast himself, used to manage a company baseball team. Older brothers Jason and Jerome were also very much into sports. The latter also tried his luck in the football team but left while in his junior year to eventually end up in the track team. The Jiao brothers were known for their powerful lungs. 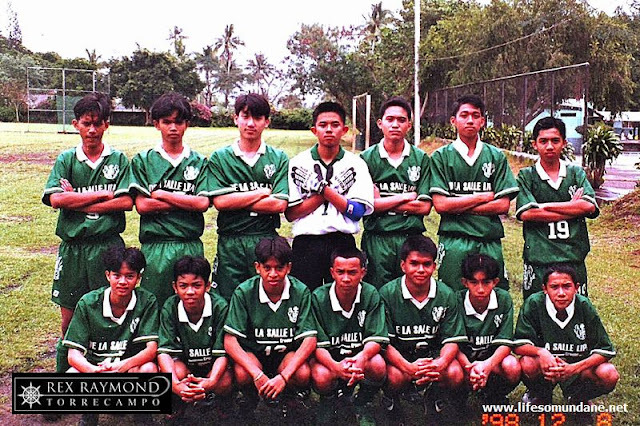 Totoy was no stranger to me because he started playing for our elementary teams and I used to see him around the field long before he suited up for my own teams. When he graduated from elementary, it was a matter of time before he came knocking on the door. Jiao was a sophomore seen above with the powerful DLSL 1999 high school team. Indeed, I used to ease younger players into my teams so that they could soak in the experience first. Not only this; most of our opponents in Manila took Grade 7 as part of the elementary curriculum. This frequently meant that, most of the time, even my senior teams would be a year younger than our opponents. Because high school boys are in the stage of rapid growth, it goes without saying that even a year’s advantage can make a significant difference in physique. The case of Totoy, however, was different. He was still growing up, yes; but he was way too good compared to other players his age. Even as a sophomore, it seemed a travesty to keep him playing at a lower level. Besides, although the high school class of 1999 would ultimately turn out to be among the strongest in three decades of football, there was a glaring hole wide on the left flank. Albeit a sophomore, Totoy was always going to be the perfect left winghalf in a team of seniors. For starters, despite his age, he was no neophyte to the game; and he had erstwhile been almost singlehandedly carrying his elementary teams. Like his older brothers, he also had great athleticism and powerful lungs. Skill-wise, he was not behind the seniors in the team. Above all, he was left-sided. Jiao representing Lipa City in the 2001 STRAA. What is it about left-sided players that it is next to impossible to teach them to use their right feet? Over the years, my experience had been that it was always immeasurably easier to teach right-sided players to use the left than the opposite. On the other hand, the great Diego Maradona was a self-confessed one-footed player. The argument always was that he was so good, anyway, that the right foot was ultimately not at all needed. I suppose the same argument held true for Totoy, whose left leg – I used to tease him – was a prop for holding the rest of him up. It had no use on the football field; and shooting drills using the right foot – which I forced – would always end up comical affairs. To call it clumsy is still being extremely kind. On the other hand, Totoy’s left foot always was a gift from the Almighty. It always was impeccable. 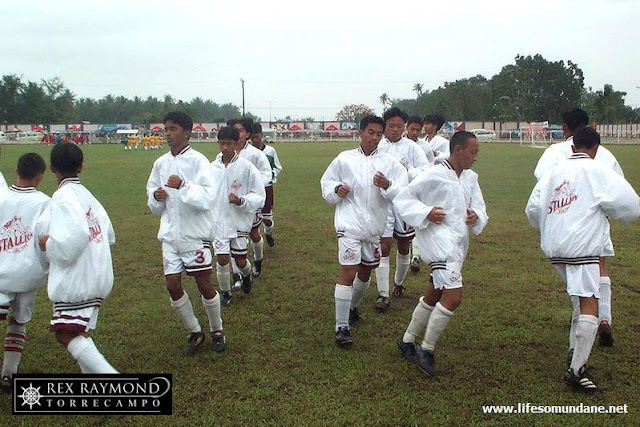 There were few things lovelier to watch on the football field than that of a young Totoy Jiao chasing after a wall pass to then deliver an inch-perfect cross for strikers to feast upon. 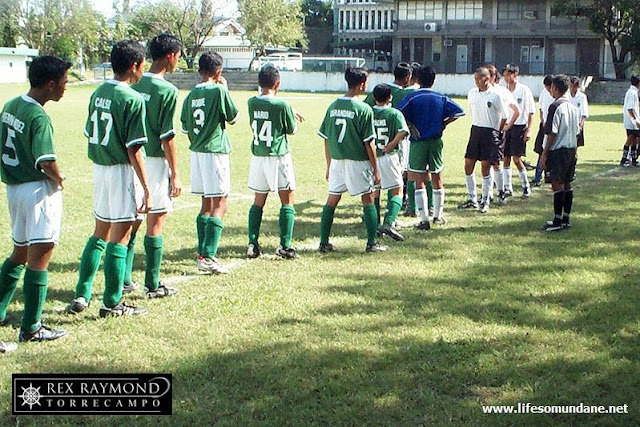 The DLSL 2001 team in the STRAA warming up before a match. Of course, in season 1998-99, we did not have a dominatingly tall center-forward to feast on Totoy’s crosses. Eldrich de Villa, though, may have a word or two to say to the contrary. His 56-goal season tally was the best ever in the high school team’s history. It was not until season 2000-01, when Totoy was a senior, that I got the tall center-forward that I had long wanted to fully benefit from Totoy’s crossing ability. James Dimaculangan, whose two older brothers played for me, finally joined us from the volleyball team. With his ability to hang in the air earned from his volleyball training, Dimaculangan was the essential centerforward to convert countless crosses from Totoy into goals. The 2001 high school squad really pales in comparison to that of 1999. The players from the earlier batch were so much more skillful and their football had so much more to offer in terms of panache. Yet, remarkably, the 2001 batch outdid 1999 in terms of results. Where the class of 1999 could only finish fourth in our high school league, the class of 2001 went a notch higher and could even have won the championship with a bit more luck. The football, though, was basic. We packed our defence with bodies and played ugly but ruthless counterattacking football. Practically everytime, the outlet pass went to Totoy Jiao on the left flank; and tall James Dimaculangan was almost always at the end of his crosses to administer the coup de grace. The DLSL 2001 high school team in the RIFA before the 8-0 rout of Southridge School. This same 1-2 punch flourished even in San Beda, where both Totoy and James went to college. The stint at San Beda brought Totoy to the attention of the national coaching staff; and it was always a simple matter for him of fulfilling a date with destiny. I had always known from the time he was young that he was headed for the national team. It was not so much that Totoy was extremely skillful. In fact, I had had so many more skillful players but who did not have it in them to become national players. For Totoy, it was the simplicity of his game that was his greatest asset. He also had the right temperament. He was never the type to sulk in the corner and always approached a match with the correct state of mind. He was always jovial on the the field and even out of it; and his bubbly character was infectious to teammates. In fact, I used to fear for my ears because, in the dressing room, he could talk a perfectly healthy individual to his death. 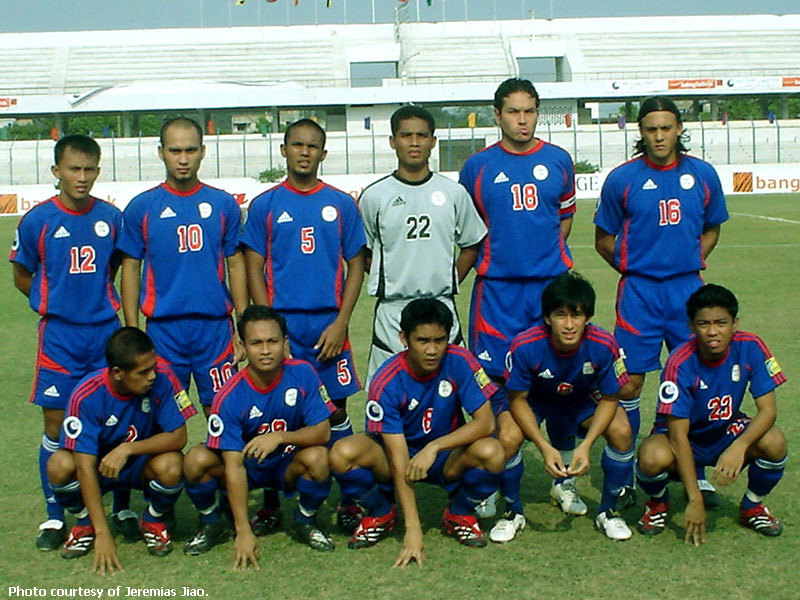 Jiao (kneeling far right) with the Philippine National Team. 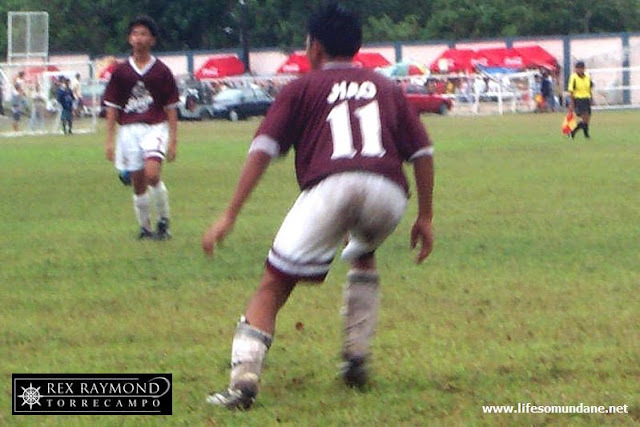 Unlike more skillful but unintelligent players, Totoy never dwelt on the ball. He let the ball do the work for him. His fitness also enabled him to not only make those delightful crosses from the left flank; he was also always able to track back to help the leftback close down the spaces. 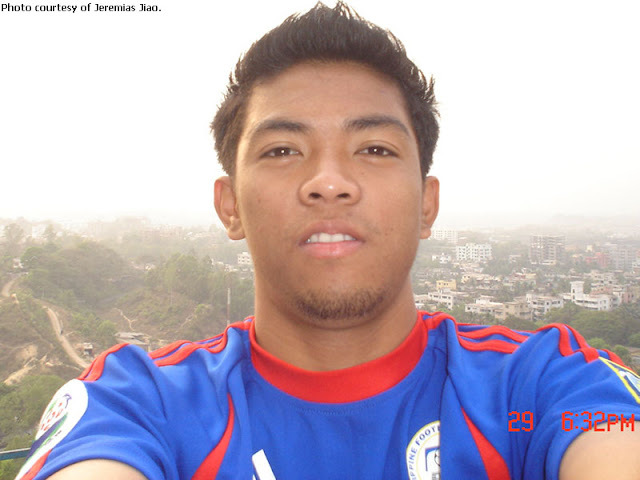 Totoy first earned under-19 caps for the Philippines in 2001 as a freshman in college. He played in international tournaments in Thailand and Cambodia. He was in the national squad that participated in the Southeast Asian Games of 2003 held in Hanoi, Vietnam. His last stint with the national side was in the 2005 AFC Challenge Cup held in Bangladesh, where the team narrowly missed out on qualification for the main tournament. Totoy also played several seasons of NCAA football for San Beda College. He also suited in the green and white of De La Salle University for a season in the UAAP while pursuing a master’s degree in Business Administration. Totoy played for Smart San Beda in the recent Smart Club Championships, where his team won first runners-up honours. He opted out of a chance to play in the current UFL Cup and is now based in Iloilo taking care of a family business with his lovely Ilongga wife Mary Margret amd 3-year old daughter. Totoy tells me that he may try to return to the football scene again next year. That is good news. There is nothing that will please me more than to see him in the all-blue of the national team again. A certain Chieffy Caligdong, of course, is in possession of the left flank. To be fair, Caligdong shades the contest because he is two-footed and has scored countless goals with his supposed weaker right foot. But when it comes to crossing ability, I will be willing to wager that – when in top form – Totoy Jiao is probably better. James Dimaculangan will probably know all about it.